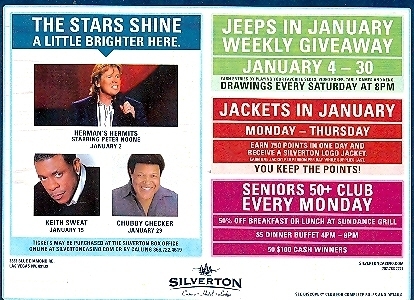 This promo card is for Herman's Hermits Peter Noone, Keith Sweat Chubby Checker performing at Silverton Hotel Casino, Las Vegas, Nevada. January 2010. Card is 6 1/4 X 8 1/2 inches, in mint condition. Buyer is responsible for 1.00 Postage within the USA and Canada. Please email if you need additional details on this card.] Thanks for checking us out!